We are an American Mountain Men party with members located throughout the state of Colorado. Our interest is in the times of the Mountain Men or Mountaineers, and beaver trappers of the Rocky Mountain Fur Trade during the years 1800 – 1840. 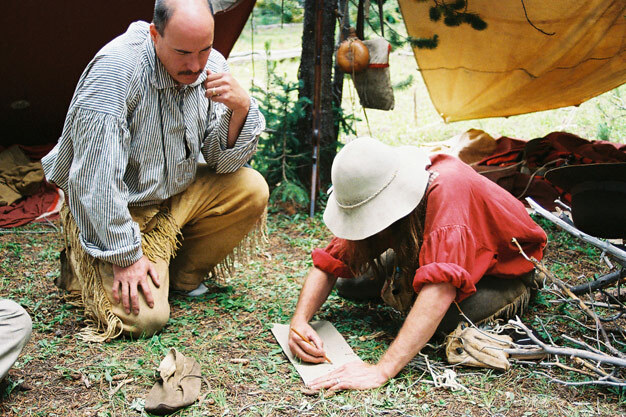 We research and recreate the ways and lives of the Mountain Men. We do this by recreating the gear, learning the skills and techniques, and putting them to use in real life situations. We freely share the information that we have learned through demos and articles. The best way to understand the lives that the Mountain Men lived is to actually get out and do it. We put our gear and skills to the test on a regular basis. This allows us to fully appreciate what they had to go through and to gain a better understanding of how they did it.